To send invitations from Lyyti, first you need to import a list of invitees. A new page opens. Now, open your Excel sheet with the list of invitees' e-mail addresses. 1. In Excel, copy the information you wish to import and paste it into Lyyti's import field. Copy only the contents and leave out column titles and such. 2. Use the given drop-down menus to determine the order of the data in your Excel file. If there are unnecessary columns you don't need to import, select --Empty-- in the corresponding drop-down. 3. If your Excel file is long and may contain incomplete contact information entries, you can use the Mandatory boxes to weed out insufficient or unqualified contacts. Let's say you need every person on the list to provide their e-mail address; tick Mandatory for the column that contains the e-mail address. All contacts who have haven't got an e-mail address will be left out. 4. If your event has participant types, you can select a participant type to apply to all contacts in this import. 5. In a multilingual event you can set a language for these contacts. 6. Lyyti automatically leaves out duplicate e-mail addresses (and compares the list to be imported with the addresses already in the event). If, however, you wish to allow duplicate e-mails to be imported, select Allow duplicate e-mail addresses. 7. Click I have permission to send messages to the contacts I am importing. Finally, click Preview to see that all information is placed in the correct columns. a. If everything is OK, click Import attendees. b. If there are formally incorrect e-mail addresses, click Back to edit the contents. c. If the list contained duplicate addresses, you get a list of all duplicates and also of addresses that for some reason cannot be imported (e.g. wrong form). Go Back to edit or simply import the ones that can be imported by clicking Import attendees. Participants can now be found in your event - their status is not reacted. Next, let's create and send the invitation. Create a new e-mail by clicking Create e-mail under Messaging in the menu to the left. Select sender, recipient(s) and subject of the message. 1. Name and e-mail address of sender. Click Settings (2) if you want to change the sender or the reply-to details. 2. Under Settings you can change the sender or reply-to details and write down an internal note of the message content. The note will not show to the recipient, only to you as the organizer. Click here to read more about sender information. 3. Choose the recipients. Click the Message recipient(s) field and choose your recipients, either by filtering or by choosing one by one. For example, you can choose to send a reminder to all registered participants. Learn more about selecting recipients. 4. Give your message a subject. The following choices concern the actual contents and sending of the message. 5. Choose a layout for your message. If you want a completely new layout, you need to start by adding it in My layouts (please see instructions here). 6. You can personalize the message with ready-made personalization codes. 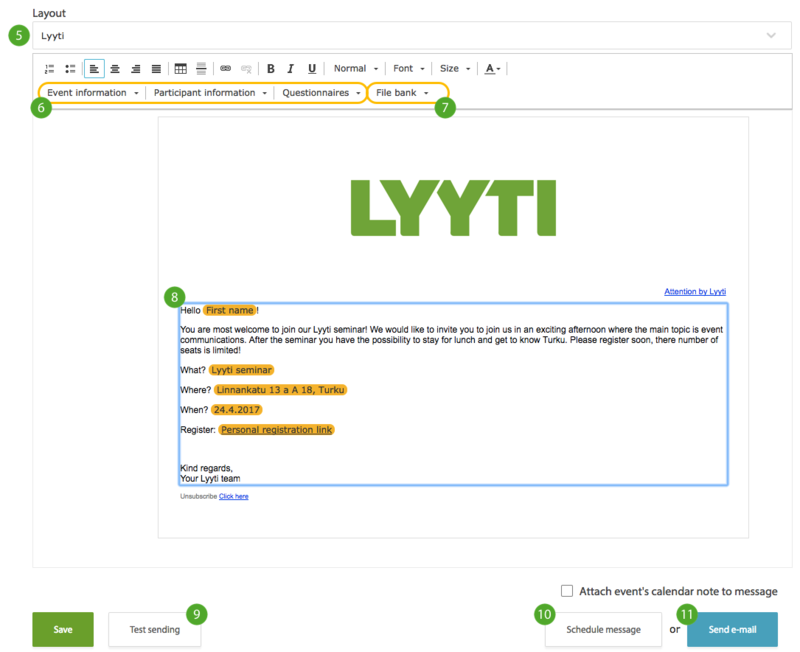 Lyyti automatically adds the personal registration link to the message, which can also be found in the text editors drop-down "Participant information". 7. You can also add attachments with personalization codes (6). 9. Send a test message to yourself by selecting "Test sending". This way you'll see exactly how the message will look to the receiver. You will need to select a participant from the list so that Lyyti knows whose personalizations to use in the message. 10 & 11. Schedule your message or send it straight away. - if you choose the recipients by filtering, the message will be sent to those who match the filtering terms at the actual time of the sending. When invitees receive your e-mail and register through their personal registration link, their status will change from not reacted into participant. Or if they decline, they will show as declined. This way your list of participants will always be up to date and you know which participants haven't reacted to your invitation, and can message them separately.